Vibrating screens mostly used in where biggeer size of material separate from fine material we can offer vibrating screens upto 35000 Kgs./Hr. 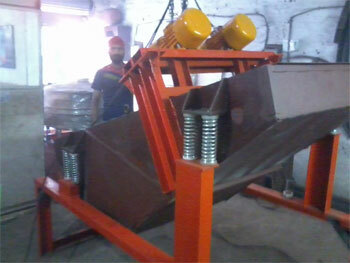 Vibratory Screen working on the principle of maximum linear movement with small verticle movement. These parameters creates due to unbalance forces generated between two unbalance motors rotating in opposite direction. ( Capacity depends upon size, density of material and moisture content) As per requirement of customer we are designing vibrating screens with 2 OR 3 Decks. Output of the first screen can be fed as the input to the second screen. The second screen will further grade & separate the material as required. We are offing this machine with Wire Mesh and Perforated screen. From 25 mm to 2 mm. Vibro Sifters are nearly similar to Vibro Screen use wire mesh or perforated or slotted sheets for carrying out separation of material as per required size. 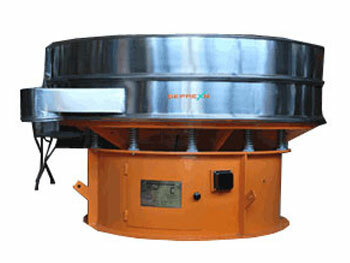 Vibro Sifters are designed to perform effective size wise separation from coarse material to Fine material . 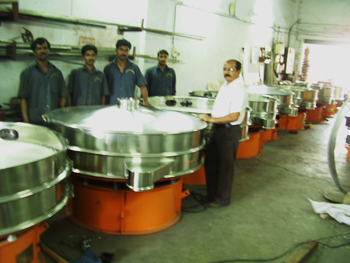 Vibro sifters are designed on the principle of Gyratory Motion and are one of the most versatile and universally adaptable machines working across spectrum of industries. 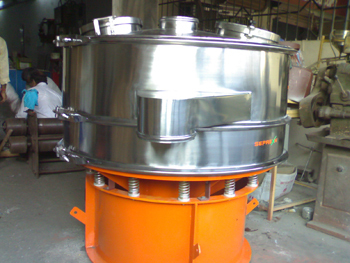 The Gyro Sifter is also called as Gyratory Screen is exclusively designed for highly efficiency required in Grains, Sugar Particles, Pharmaceutical operation, Bulk Drug, Food Product, this machine creates for multi plan vibratory motions. This offering in SS304 OR SS316 Contract parts as well as fully in stainless steel. 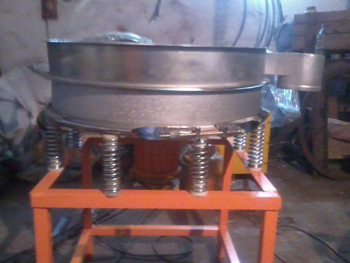 Flow Separator is having 2 Vibratory motors mounted either side of mesh Frame. Discharge of screening material getting from bottom. Advantage of this screening machine is direct vibration closer to mesh frame hence for more cycles per unit area, which helps 25% more productivity than standard vibratory screen also lesser chances of mesh clogging. Looking to In-Line Packing process or material Flow Through between nos. of equipment. Here production does not allow screening separately for this purpose Nishi Techno Sys modified discharge of standard vibro screen. 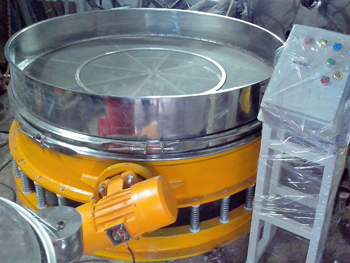 Cross Cross Flow Separator useful in Food Industry, Chemical Industry and Pharmaceutical Industry. You can also install this screen above SILOs, Hopper, or you can directly pack solid screened material in to bags. Nishi Techno Sys developed vibro screen to over come issues in Solid - Liquid process, this separator create 3 plan motion gentally vibration, so that liquid will not bounce out of periphery and also solid particles move fast towards periphery with lesser moisture content. 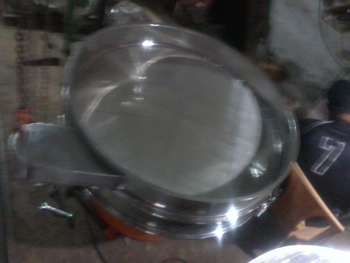 This Solid - Liquid separator we are also offering with diverters, velocity breakers on optional basis. For Solid - Liquid application we are offering our model NT-36 (900 mm diameter) UPTO NT-60 (1500 mm diameter) with mesh up to 350 mesh. Soild - Liquid Separator can be used in Paper Mill, Sugar Mill, Food Industry, Ceramic Tiles manufacturer, Starch Production, Gelatine process. Industries we serve : Abrasive Industry, Paper mill Industry, Sugar Mill Industry, Ceramic tiles manufacturer Industry, Metal Industry, Food Powder Industry, Milk powder Industry, Mineral processors Industry, glass industry, Dyes industry, Detergent manufacturer Industry, ash Industry, cashew Industry, Biscuits manufacturer Industry, Resins Industry, Chemical Industry, Guar Gum Industry, Atta Industry, Masala Industry, Explosive Industry, Gelatin manufacturer Industry, Polymer Industry, Pharmaceutical Industry, Bulk Drug Industry etc.